Deck railing is step 6 (of 7) on the how to build a 10' x 10' deck example. Railing is required for decks that are 30" (762 mm) or more above the ground. 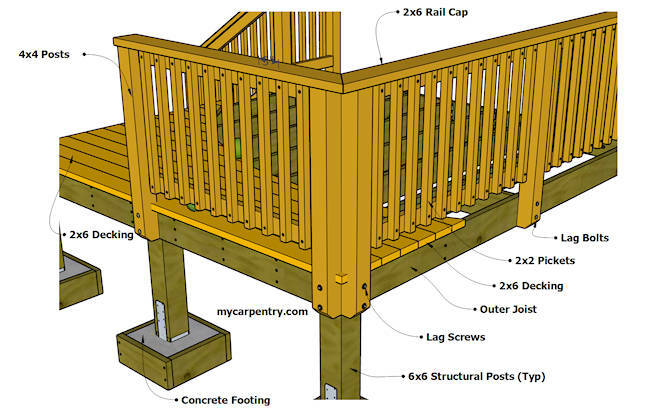 This tutorial provides the procedures for constructing deck railing, as well as some building code information. But you should always check your local building code for specifics related to deck and railing requirements before you design and build your deck. Besides safety, there are other reasons why you might want to add deck railing - for example, it is great to lean on while standing and having a conversation with someone. It also provides a great place to set your coffee or cold beverage. Building code suggests that rail post span should not exceed 72" (1829 mm) - measured from the center of each post. Rail posts (also referred to as Guard Posts) are generally spaced evenly between straight sections of deck. Space between the pickets and below the bottom rail should not allow a 4" (102 mm) sphere to pass through. The finished height the of the deck railing should not be less 36" (914 mm), measured from the surface of the decking to the top of the rail cap. 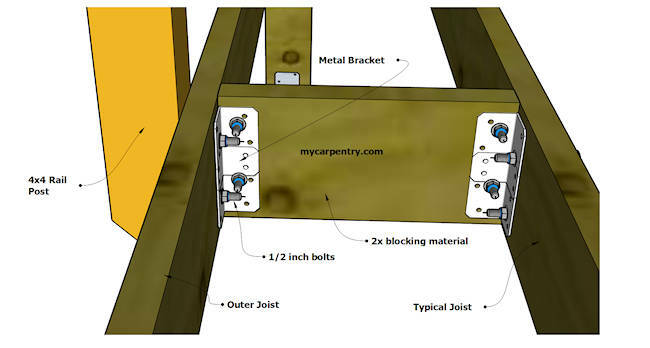 Deck rail posts that are attached to the outer joists should have 2x blocking material at each post and hold-down anchors similar to the metal brackets shown in the diagram below. Two 1/2" through-bolts should be used to attach each 4x4 post to the outer joists through the hold-down anchors. Corner posts can be attached using two 1/2" screws per post. 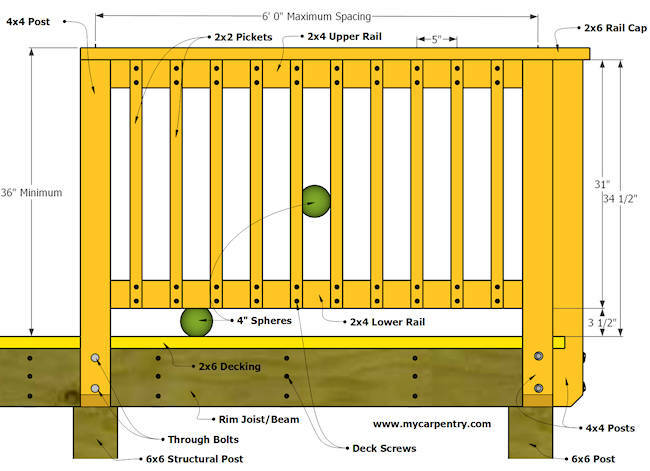 For complete details on 4x4 deck post attachment, refer to the Prescriptive Residential Wood Deck Construction Guide (link at the bottom of the page). Once the 4x4 rail posts are plumbed and properly attached to the deck frame, the 2x4 rails and pickets can be added. There's no real trick to laying out the 2x4 rails for pickets, but there's a few things to keep in mind before you get started. First, you want the picket spacing on each end of the rail section to be equal. Second, you want the run-out of the pickets to be such that a picket layout mark does not land partially onto the end of a 2x4 rail. There are two ways to layout the 2x4 rails for the pickets (shown as Option A and Option B below). They are both correct, but the option you choose depends on the width of the rail section between the 4x4 posts. We will compare both options. Note: The Prescriptive Deck Guide shows the 2x4 rails attached to the inside face of the 4x4 posts, not between them. This may be a building code requirement in some areas, however, I have always built railing where the 2x4 rails attach between the posts. Contact your local building code authorities for details in your area. I will proceed as though it is acceptable to attach the 2x4 rails between the posts. 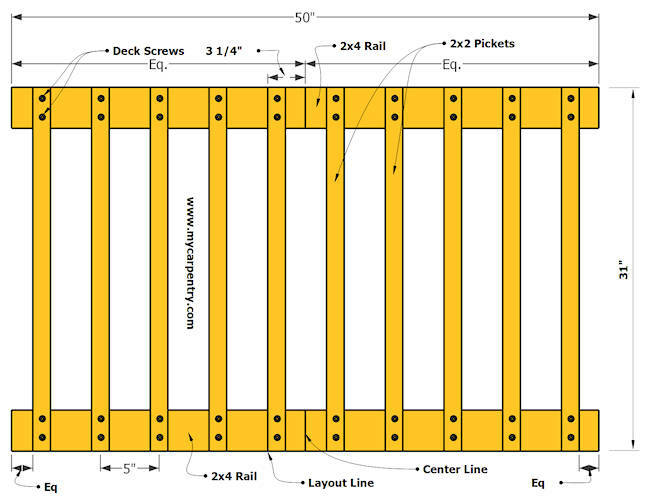 Either way you attach your 2x4 railing, the picket layout concept is the same. Measure between two of the 4x4 posts at the deck level (just in case the posts aren't perfectly plumb, this measurement will be more accurate) and cut both top and bottom 2x4 rails this length. For this example purposes, I will use 50" (1270 mm) as the distance between 4x4 posts. To determine which layout option to use (A or B), I will test them both. First, Option A - determine the center of the 2x4 railing (25" from each end). Option A starts with a picket at the center of the 2x4 railing. To start the layout, measure from the center mark to the left, half the width of a picket (3/4"), and make a mark. This mark will be the location of the left edge of the first (center) picket. Measure to the right of this mark and make a mark every 5" (127 mm) until you reach the end of the 2x4 rail (See Option A diagram below). The diagram shows that Option A is not the best option because the middle of one picket breaks at the end of the 2x4 rail. We could move it over, but that would be ugly and mess up the spacing between pickets. We could get rid of the last picket, but then the space between the last picket and the 4x4 post would exceed the 4" gap requirement. Option B - determine the center of the 2x4 railing (25") and measure to the left, half the width of a picket (3/4") plus half the spacing of the pickets (2 1/2"), resulting in the first layout mark to be 3 1/4" to the left of the center mark. As in Option A, this will be location of the left edge of the first (off-center) picket. Measure to the right and make a mark every 5". The diagram below shows Option B to be the best choice because the pickets at either end do not interfere with the 4x4 posts and do not have a gap where a 4" sphere could pass. Next, measure to the left of the first layout mark and make a mark every 5 inches to complete the picket layout. Transfer this layout to the remaining 2x4 rail. The layout option (A or B) you choose depends on the space between the 4x4 posts. For instance, if the posts were spaced 48" apart, Option A would likely be the best choice. Lay the rails flat on the deck. Cut the pickets to length (31" in this case), square them to the upper and lower rails and attach them at the layout marks using two 2 1/2" deck screws per rail. Attach the completed rail/picket assembly to the top inside faces of the two 4x4 posts using deck screws or 8d threaded nails. Repeat the Option A/Option B process above on all remaining rail sections. Once all of the rail/picket assemblies have been installed, screw/nail the 2x6 Rail Cap into the top of the 4x4s and into the top 2x4 rail. For deck design and structural information, check out the Prescriptive Residential Wood Deck Construction Guide, by the American Wood Council.